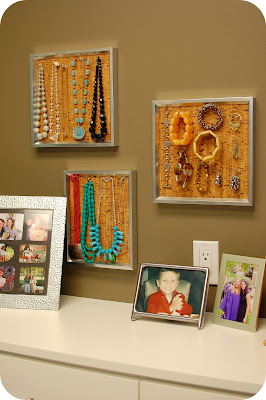 Here's a super easy idea for a jewelry organizer. Remove backing and glass from frame. Cut cork tiles to size using metal straight edge and utility knife and insert into frame. Replace backing on frame. 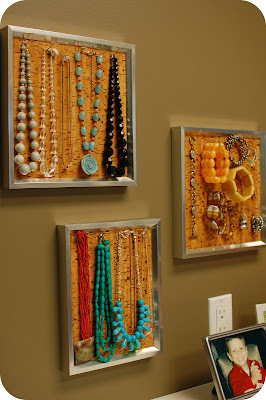 Hang frames, insert pins and display jewelry. That's it! Pretty easy. 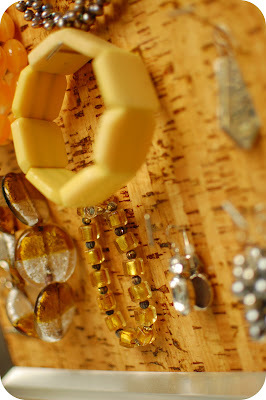 If you aren't crazy about the look of the cork, simply cover the cork with a piece of fabric before inserting into frame. My jewelry organizers are hanging up in my closet. I really like having the jewelry out - it makes it easy to find what I'm looking for. 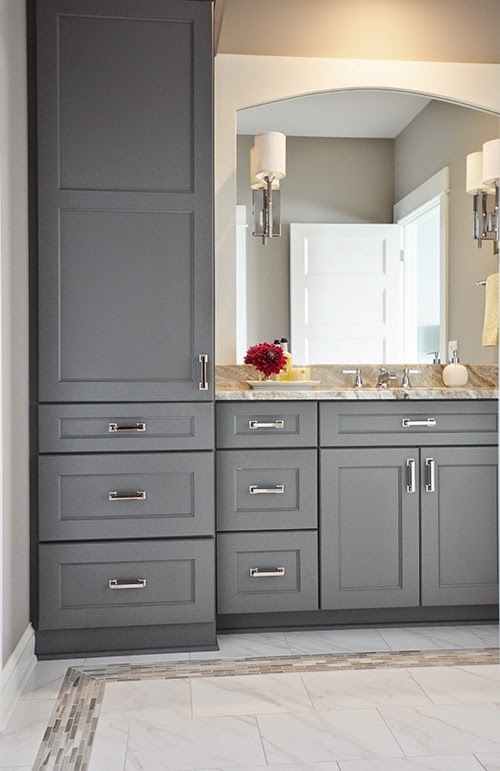 This is a really easy project and I think it looks great! I did something so similar to this on my blog. Great minds! 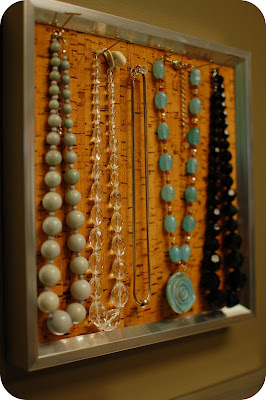 I have been searching for a way to display my jewelry AND something to do with the extra cork tiles I have lying around... thanks! This looks great. 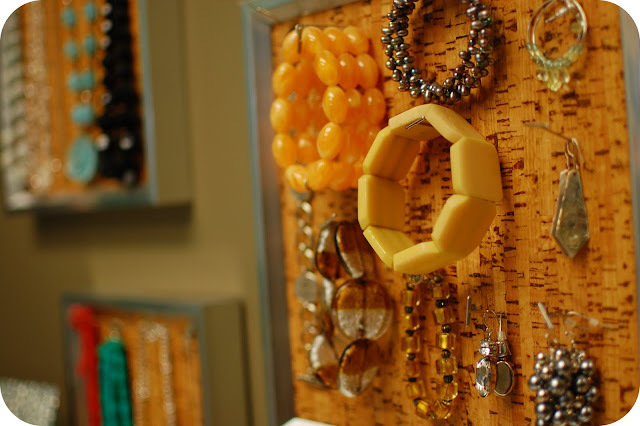 I love having jewelry displayed and organized. 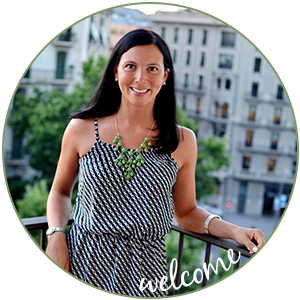 I'm having another We're Organzied Wednesday link party this Wednesday. I would love it if you could join. There's a giveaway too. Hope I see you there. These are great! I love the modern looking frames. Brilliant and so easy! I love that you put them in the closet, too. That makes so much sense. i just did a version of this...stay tuned to my blog to see (i will link to YOU!) thanks for the great inspiration! Oh this is nice! And sounds so easy too. You do have pretty jewellery! Lovely jewellery organiser! This can also work as a wall art! Thanks for sharing. Great idea! I will have to buy some so I can display and keep my favorites right where I can see them!! Thanks for the sharing this. it turned out great!Thanks for sharing your thoughts with us. they are really interesting.. I would like to read more from you.